Analysis, design and testing of steel structural components and structures has been one of the challenging research areas to the researchers across the globe. In order to understand the behavior of various hot-rolled and cold-rolled steel structural components and structures. Research activities in the area of steel structures was started at CSIR-SERC about 3 decades before. A number of pioneering contributions were made by the scientists of Steel Structures Laboratory including the formulation of number of guidelines to IS:800-2007 and IS:801-Draft codes of practice. 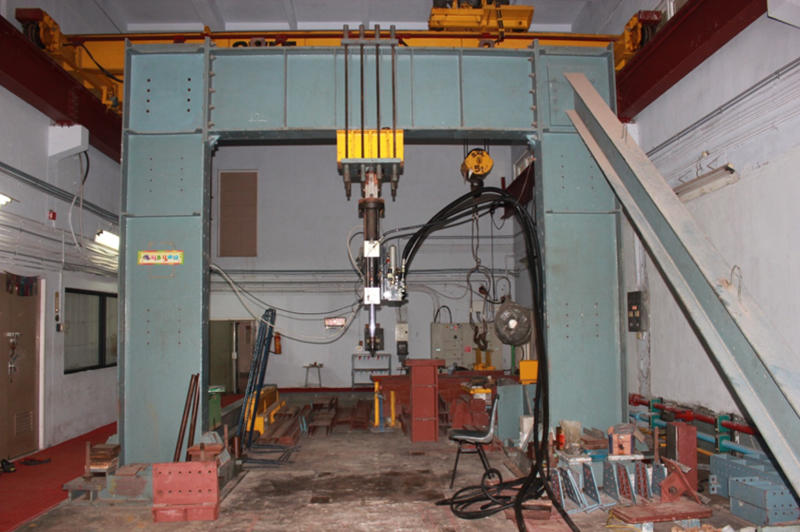 Apart from the desktop and laptop computers to meet the computational requirements of the scientists, SSRF also has a test floor for conducting experimental investigations upto 250 kN of loading. Steel Structures Laboratory has a fatigue-rated 50 kN actuator with a stroke of ±125 mm. To augment the research related to steel-foam concrete composite panels Steel Structures Laboratory has an automatic foam concrete mixer machine. For health assessment of steel buildings and structures, non-destructive testing & evaluation (NDT&E) equipments/tools such as coating thickness gauge, hardness tester, thickness gauge, dye penetrant test, ultrasonic flaw detector, magnetic particle testing and 3D disto are available at Steel Structures Laboratory. Steel Structures Laboratory also has an electochemical modular workstation (Autolab) with potentiostat/galvanostat for induced corrosion simulation and measurements. IR camera and pyrometer available at Steel Structures Laboratory can be used for elevated temperature simulation and measurements.